We wish to thank The Model Engineer, Nexus Special Interests Ltd., for permission to reproduce the following article, originally published in the Model Engineer. Vol. 129, Whole No. 3238 (1 December, 1963): 539-540. 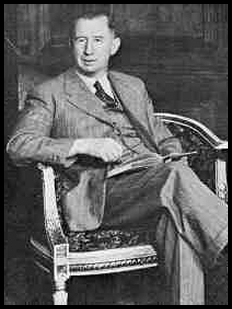 Few among the millions who enjoy the novels of Nevil Shute know that he was a model engineer. His knowledge of modelling, and of the links which it forms among men across the world, provided him with the theme of "Trustee from the Toolroom". But how many were aware that Nevil Shute Norway, to use his full name, was himself a builder of models from the pages of ME? 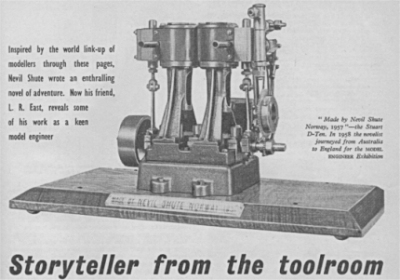 "Trustee from the Toolroom" is an adventure story in which a model engineer--drawn to some extent around Edgar Westbury--plays the leading part. When he was writing this story, Nevil borrowed volumes of the MODEL ENGINEER from me so that his references to a Congreve clock would be accurate in detail. There was nothing casual in his writing, and there was no guesswork in his own workshop - for he was a true model engineer in spirit, and a member of our Melbourne SMEE. Before he left England he completed a one-eighth h.p. 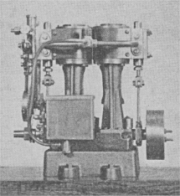 horizontal single-cylinder petrol engine to Stuart Turner No 800 castings and added a mechanical lubricator. It was described and illustrated in ME of 27 January 1949. He brought it with him to Australia and displayed it working at one of our exhibitions.